After the dramatic improvements of H&S using systematic procedural techniques, the quest for zero incident rates has remained illusive. Continuously tightening work place discipline and rigour can prove counter productive if it leads to a ‘them and us’ mentality characterised by mistrust, resentment and disaffection. Trust and mutual respect are only achieved through proper consideration of the human factor in the risk equation. Many different aspects of personality are related to risk taking; it is not a simple scale between ultra cautiousness and uncontrolled recklessness. To enrich organisational risk culture it is necessary first to respect the reality that each person contributing to that culture will be distinctive in their nature and in their own risk dispositions. Research psychology identifies the elements of personality that define an individual’s propensity for risk-taking. The Risk Type Compass® (RTC), is a personality measure based on these research findings. It is a questionnaire that assigns each person to one of eight distinctive Risk Types. This is the psychometric tool that drives the RISK WOTCH™ programme. Through PCL’s RISK WOTCH™ programme, employees are encouraged to continue to the higher maturity levels of ‘Expert’ and ‘Master’. Advancement in risk maturity would reflect; 1) experience, 2) expertise, and 3) workshop attendance and ‘badge of achievement’ in the internalisation of the principles around behavioural safety. Entry-level employee who has not undergone any H&S training. More experienced and attended the available company H&S training. This also represents moving from an apprentice to an experienced team member. of a stronger and more resilient safety culture. The RISK WOTCH™ approach establishes a horizon beyond compliance and unquestioning obedience and towards a more engaged proactive mind-set, encouraging attitudes and behaviours that promote self-regulation at the individual and team level. Rather than “having to work safe”, “wanting to work safe” – and knowing what that means for particular risk types. All RISK WOTCH™ participants complete the Risk Type Compass®. Each participant receives a comprehensive personal Risk Type Compass® report. This identifies and explains their Risk Type and the advantages and challenges that this implies. Each participant signs up to one of the group coaching events scheduled for their own Risk Type. These events address the implications of that Risk Type, exploring the problems, advantages and issues that are specific to them. Participants have the opportunity to discuss issues, benefits, pitfalls and strategies drawing from their shared experiences. They clarify the implications for themselves within the context of their role and identify a personal agenda of what ‘taking personal responsibility’ implies for them. Risk Type Compass® aggregated data serves as a team audit tool that provides an agenda for a one-day team exercise. This is designed to explore the impact of that particular permutation of Risk Types on group dynamics and decision- making. The event presents aggregated RTC data for the group. These consider the balance and distribution of Risk Types, the influence of each Risk Type disposition on the group, the likely effects of omission of one or more Risk Types, tensions caused by opposing factions arising from Risk Type distribution, and the potential for ‘Risk Escalation’ when group imbalance tips risk- taking towards either extreme. These analyses of group functioning are designed to enhance the team’s awareness of its strengths, its challenges and current effectiveness as well as its contribution to the wider organisation. These processes, all built on the Risk Type Compass® assessment, give each participant their own blueprint for development: an individual route map to greater personal responsibility and ownership. The aim is to facilitate openness, dialogue and mutual respect; positive influences on personal and team accountability and safety performance. as critical in impacting on the H&S incident plateau and as complementary to top-down regulatory strategies. The challenge is to create a culture where people want and choose to accept personal responsibility and where those achieving higher levels in the maturity model increasingly hold themselves accountable for their own risk influence and decision making. To manage organisational risk culture, it is first necessary to recognise that each person contributing to that culture will be distinctive in their nature and have their own risk disposition. 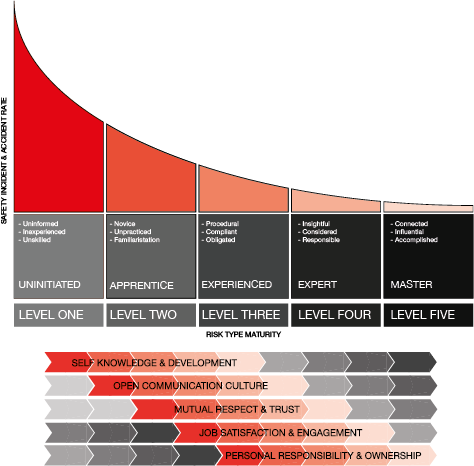 Risk Type Maturity recognises personal responsibility, achieved through self-knowledge and openness, as the means to attaining the vigilance and consistency levels required to maximise safety performance.